I’ll admit it – I’m a germaphobe. I’m always conscious of the cleanliness of my surroundings whether I’m at a crowded mall or hospital waiting room. It’s in the back of mind about how many germs are floating around. I also clean my house daily and keep it neat and tidy. Surprisingly, there is one thing I didn’t really consider until now. The air quality in my house. I’m someone who spends a lot of time at home being a work-at-home mom. I open windows in the summer to let the fresh air in, but once the furnace goes on, the windows are shut till Spring. Sure, I can light candles to make it smell pretty, but how fresh is the air really? I only learned about the Venta Airwasher recently and since then I’ve been hooked on using mine! 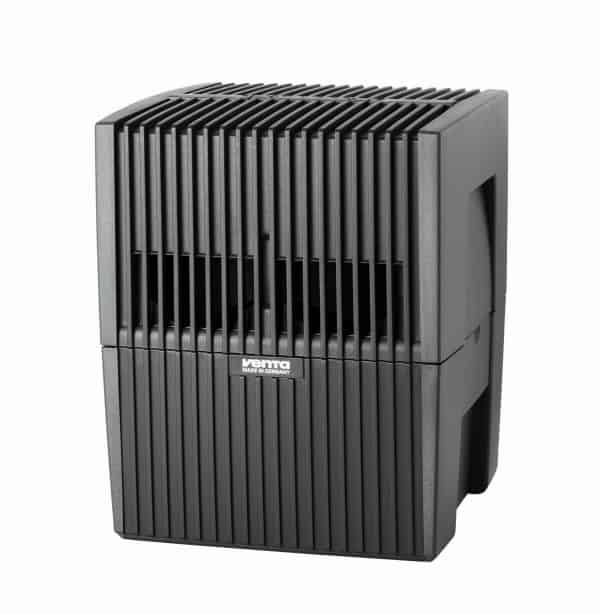 The Venta Airwasher is a premium 2-in-1 system that humidifies dry air AND at the same time, purifies it. Plus, there’s no icky filter pads to deal with! How it works is really quite basic. The Venta Airwasher uses water as the filter and works on the process of cold evaporation. The dry, dirty indoor air is drawn and washed by the water. 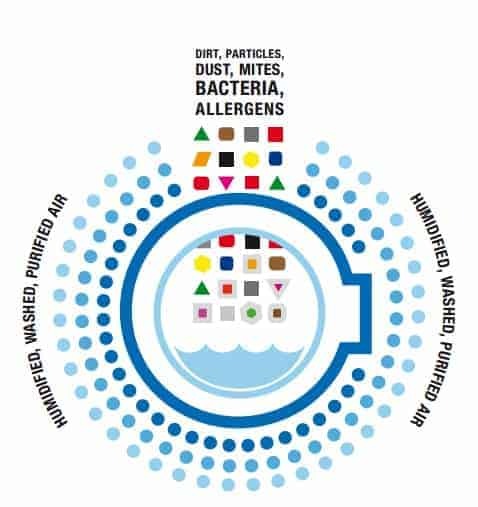 This process stops the transmission of bacteria, germs, dust, allergens and odour. The pure water evaporates and humidifies the air to the perfect level. 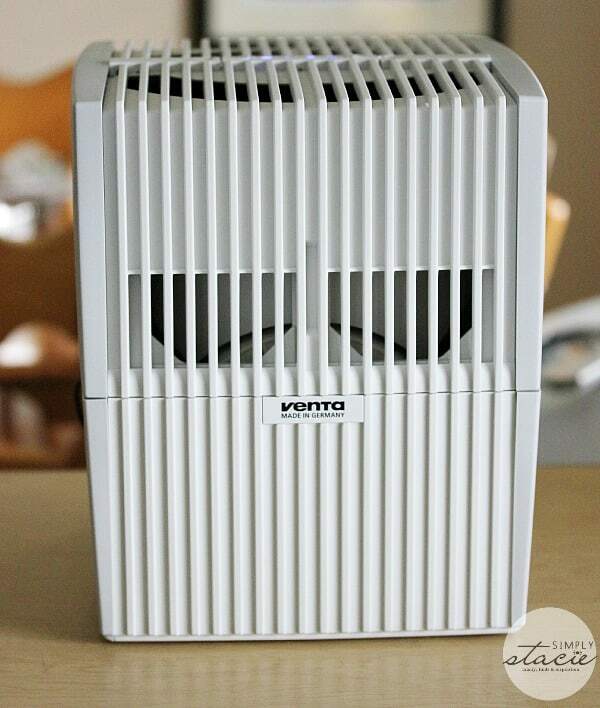 With cold & flu season now here, I’m glad to have a Venta Airwasher in my home. I consider it a proactive step to try and keep the sickness at bay. 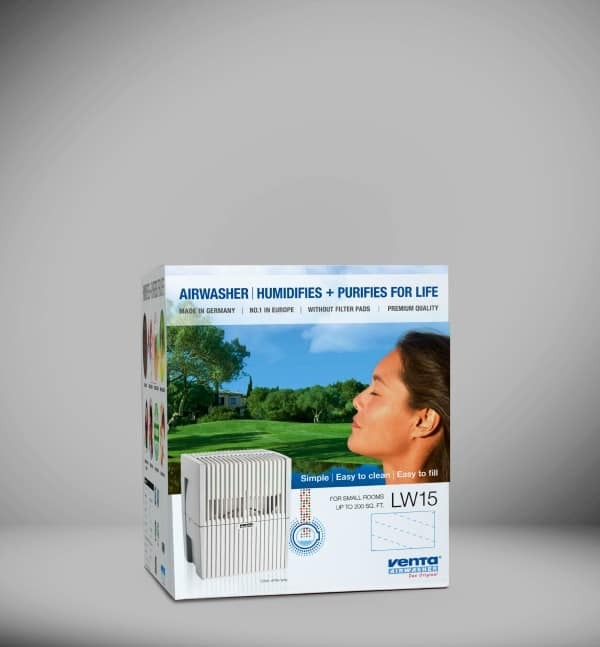 The Venta Airwashers are made in Germany and are Europe’s Number 1 bestseller for humidiers and purifiers. With its many benefits and how easy it is to use, I can certainly see why so many people love it for their home and office. This hygienic product is built to last a lifetime and is extremely easy to operate and clean. To use it you fill it up with with fresh tap water every day and plug it in. Yes, it’s that simple. Maintenance is also minimal. Every two weeks, rinse and wipe out the lower housing unit with a damp sponge. I was expecting a lot more in terms of maintenance, but the Venta Airwasher isn’t like the previous humidifiers I’ve owned. I have the Venta Airwasher LW15 in my bedroom. It is designed for rooms up to 200 square feet and is ideal for small rooms. I was surprised how quiet it was. I barely notice it at all when it’s running. They also sell other models for bigger rooms. I’d like to get the LW45 for my basement family room. The cats hang out down there and I want to see if it helps my mom’s allergies. She’s allergic to cats and can’t spend much time in the basement when she comes to visit. I’m also looking forward to seeing how it helps my skin this winter. My hands get so dry that they crack and bleed during the cold, dry winter months. I am noticing that I’m sleeping a lot better and I haven’t woken up with a headache since starting to use the Venta Airwasher in my room. I used to wake up with headaches several times a month. I’m hoping they stay away for good! The Venta Airwasher LW15 has an SRP of $219.99 and comes in two colours: gray and white. The LW25 is $299.99 and the LW45 is $399.99. You can buy them online or find a retailer that carries them near you. I found them at Bed, Bath & Beyond in my area. Give the gift of wellness this holiday season with a Venta Airwasher! Unique – simple – efficient. These are the factors behind Venta’s success. I learned that they’re eco-friendly. Yay! I like that it helps clean pollen out of the air. I like that it helps take pollen out of the air. That it helps remove pollen from the air. Thanks for the giveaway… the Venta Airwasher Humidifer incorporates cold water evaporation, trapping allergens and irritants within the device; also, various fragrances are available to add to the water to give your room a pleasant scent. I learned that because the Venta Airwasher is very energy efficient, operating costs are very low even when used all the time. For consistent results, it should be run continuously. I learned (And LOVE) that it could help with all the allergens in my house! I learned that the Venta Airwash works best in closed rooms to maintain a consistent level of humidity. I like that this appliance can help prevent the dry skin and congestion that I experience this time of year. fwoodstove season. This would be perfect.